Today is the day to celebrate the most adored and deeply respected food of them all...Chocolate! Celebrations obviously involve a large consumption of chocolate as people indulge in a Willy Wonker world of mouth-watering beauty in that short period of time, getting away from reality and blaming it on the fact its ‘international chocolate day’. With such a wonderful day upon us, we would like to offer our chocolate brown hair colours to YOU. 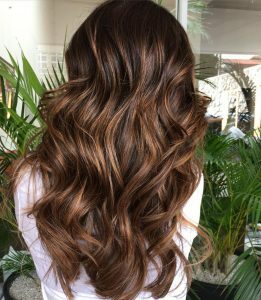 Our range of chocolate brown hair colours are here for YOU, to make YOU feel special and look the best that YOU possibly can. The elegance of the chocolate brown range brings out the beauty within you, whilst delivering the feeling of warmth and happiness throughout. n this photo a lovely Chocolate brown.